Four men were jailed and scores arrested following violent clashes between hundreds of youths which led to a public outcry and press outrage nearly five decades ago. Bottles were thrown at police, officers fought running battles with teenagers and homes and businesses were vandalised. The clashes between Mods and Rockers in Margate, Kent, during Whitsun weekend in 1964 were dubbed "gang warfare" and the "battle of the beaches". The 1979 film Quadrophenia famously dramatised the violence in nearby Brighton to the sound of The Who and Margate is now capitalising on its infamous past. An exhibition called Talking Bout My Generation is being hosted in the building where the offenders were sentenced. The furniture has changed very little since Dr George Simpson, chairman of Margate magistrates, jailed four "sawdust Caesars", "infected with this vicious virus" for their part in the Whitsun violence. During the speech he said: "It is not likely that the air of this town has ever been polluted by the hordes of hooligans, male and female, such as we have seen this weekend and whom you are an example. The Mods wore designer suits, parka jackets and rode Vespa and Lambretta scooters. They listened to soul and ska music and some British bands such as The Who, The Small Faces and The Kinks. The Rockers rode powerful motorcycles, notability Norton and Triumph bikes, and wore leathers. "These long-haired, mentally unstable, petty little hoodlums, these sawdust Caesars who can only find courage like rats hunting in packs, came to Margate with the avowed intent on interfering with the life and properties of its inhabitants." Now instead of defendants, shocked locals and reporters eager for quotes, the court room is filled with memorabilia, newspaper clippings and a vintage Triumph motorbike. One of the building's four holding cells, which housed more than 50 people between them during the disturbances, now contains a Lambretta scooter and two mannequin Mods. Ian Dickie, of the Friends of Margate Museum, said a number of the events portrayed in Quadrophenia and set in Brighton actually took place in Margate and they wanted to display this social history. "In Quadrophenia they use terms like 'sawdust Caesars'. That was Dr Simpson's quote. That was here, not Brighton. "A lot of Quadrophenia is based on Margate." During the riots he was pushed into a coffee bar and told to look after the girls inside, which he said was like a "dream come true" for a 16-year-old boy. He said a lot of the visitors had told staff the press accounts of the day hyped up the violence. "We've had Mods in, we've had Rockers in, we've had police officers in and we've had the general public in. All of them have said it wasn't as bad as it was made out. "Most of the injuries on the first day occurred from falling over, when they were running - tripping over pavements and their feet. "There were one or two stabbings the next day but as soon as word got out that Dr Simpson was sending people to prison they all stopped. They suddenly dried up," said Mr Dickie. Chris Tull, of Thanet District Council, agreed. "In today's terms it was probably something like an ordinary Saturday night in any town centre but at the time nobody had seen anything like it before," he said. "Part of what happened in 1964, it's not the actual riots themselves - that's probably the bad side of it. "What we've got to recognise is the whole generation of change that was exploiting its freedoms, post-war. "A generation that had the ability or affordability of being able to have personal transport, either a car, a motorcycle or a scooter." Since the exhibition opened on 9 September the museum has had 2,000 visitors. "There's a buzz in here, unlike a library, you here conversations going on and people recollecting. "We're actually finding that one or two of the [museum] volunteers are old Mods and Rockers themselves and actually come along on the day and share those experiences," Mr Tull added. "People are coming here with good memories. 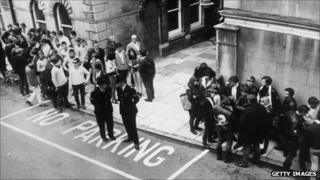 All the people that come down - the Mods and Rockers still have good memories of what went on," Mr Dickie added. "They still have good memories of the fun time they had. It's appealing to lots of people and bringing people down specifically for that reason." But not everyone has such fond memories of the disturbances. "One of the most interesting people we had in, that came and spoke to us, was the grandson of one of the traditional seaside landladies," said Mr Tull. "He actually portrayed a totally different story to the ones that are glamorised in the films. "He actually said her [his grandmother's] bookings actually nose-dived for two months after. So there was a downside."